Not to be confused with World 1-5, Level 1-5, or Stage 1-5. Area 1-5 is the fifth course of Coaster Hills and the fifth course overall in Mario vs. Donkey Kong: Mini-Land Mayhem!. It introduces Hammers and Shy Guys. Both Minis begin on the top left, with the exit door on the bottom left. In order to reach it, the two Minis must fall down a level from the right side of the stage. After evading a Shy Guy, the Mini Marios will be right to the exit. The M-Token is located at the upper level on the right, just below the Mini Mario Card. It can be collected by drawing a Red Girder slope, then removing it just as the back Mini Mario is about to reach the top. 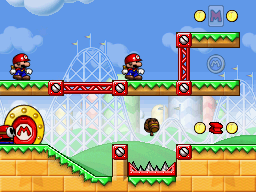 The Mini Mario Card is located on the upper level on the right, just above the M-Token. It can be collected by drawing a Red Girder slope straight to it. This page was last edited on September 18, 2018, at 03:50.